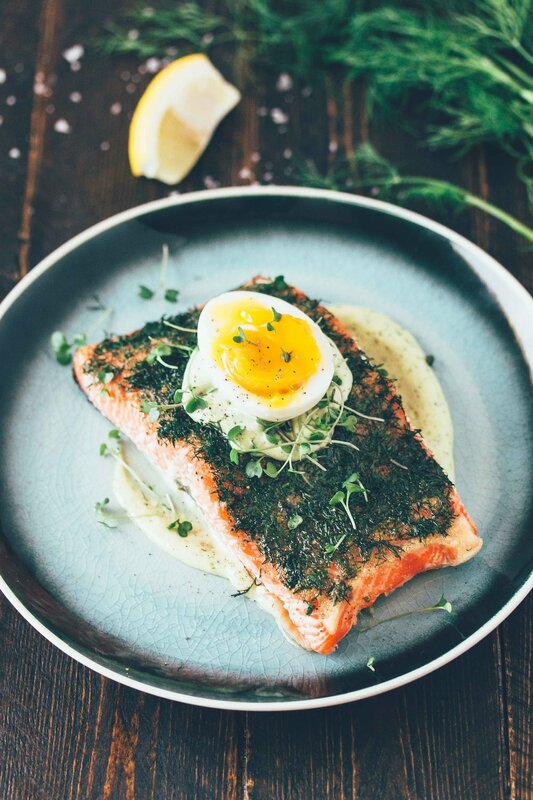 Believe it or not, this herb salmon recipe was the first to grace BRG. Believe it or not, this recipe (or one very close to it) was the first to grace BRG. It was one of the first things I learned to cook really well when I started to try and eat healthier about 10 years ago. I didn’t know much but everyone said “eat fish!” So I did. I learned quickly that eating a lot of fish, particularly salmon, was no fun if it was overcooked. There is literally not much worse than dry, fishy fish. So I’ve settled on high oven heat & short cooking time. Bonus if you can grab a filet that is an inch or more thick, as it’ll be much easier to achieve the medium to medium-rare center. This recipe works just fine without the sauce and the egg. But I can’t stress enough what a game changer this sauce is. GAME. CHANGER. Line a sheet pan with parchment or silpat mat. Let the salmon rest while the oven is preheating. Bake for 8-12 minutes. Cook shorter (8 min) for a filet 1/2″ thick and longer (12 min) for 1 1/2″ thick. Note: if using cast iron (like shown here), you’ll want to shorten cooking time by 1-2 minutes. Move the salmon from the pan to prevent it from cooking further. Serve immediately topped with the Creamy Garlic Dill Sauce and an egg, as desired. Add the egg, lemon juice, garlic, dijon mustard, sea salt, black pepper, and dill to a blender. Blend until smooth, about 15 seconds. With the mixer running on low, drizzle in the avocado oil through the top hole. Move the speed to high for 10 seconds. You should hear the blender struggle a bit as the mixture thickens at this point. Don’t blend any further. Store extras in the refrigerator for up to 2 weeks.